It's that time of the week -- the markets are almost closed. It's time to think about anything else except the markets. I'll be back early Monday morning. From Econoday. Click for a larger image. -- Referring to the chart above, the gray line was decreasing for 7 months, albeit not continually. That means the latest news is counter-trend. Before we get excited about the change in direction, remember we need additional data to day things are definitely better. -- The general change is encouraging; a jump of 24 points is good news. -- In addition, the jump in new orders and shipments is also encouraging. However it's one months worth of data. -- The continued drop in inventories is also encouraging because it indicates people are getting more and more "down to the bone" and will be forced to by simply to have a few items in stock. -- The overall index increased. BUT as the chart at the top of this post notes we're still at low levels. The line that represents the Philly index does appear to be bottoming, but we need more data and a strong and continued move higher to say for sure. In addition, the index has been negative for 16 of the last 17 months. -- While the new order number rose, the shipments number decreased. -- The future expectations index has been positive for the last 4 months. However, it's easy for people to say "things will get better". It's a good sign , but take it with a grain of salt. There are encouraging signs. BUT -- the data points supporting that statement aren't numerous. Instead they are one or a few months worth of data. So keep that in mind when reading them. JPMorgan Chase & Co. (JPM), bracing itself for more loan losses driven by the recession, delivered surprisingly strong first quarter results on Thursday. Carried mainly by a recovery in securities trading that lifted JPMorgan Chase's investment banking revenue to a record, the bank said it's strong enough to pay back the U.S. Treasury Department even as it had to set more money aside for rising delinquencies and loan losses. Bond trading took away much of the pain from the recession. JPMorgan Chase's profit for the quarter fell 10% from a year earlier, to $2.1 billion, but revenue jumped 48%, to $25.03 billion. The bank's shares rose about 1% in recent trading, to just almost $33. Write downs related to illiquid, or so called toxic, securities and loans are "getting to be much less noteworthy," Chief Financial Officer Michael Cavanagh told investors during a conference call. However, JPMorgan Chase set aside $4.2 billion to cover future loan losses, $100 million more than in the fourth quarter - more than some analysts had expected. JPMorgan Chase has a war chest of $28 billion to cover future loan losses, and that reserve is "staggeringly high" for some loan portfolios, Cavanagh said. Loan losses are expected to continue to rise, but not more so than previously expected, he said. -- Thank God for trading desks. Citigroup Inc., the U.S. bank rescued by $45 billion in U.S. taxpayer funds, ended a five- quarter losing streak with a $1.6 billion profit on trading gains and an accounting benefit for companies in distress. Citigroup surged 17 percent in New York trading. The first- quarter profit compared with a net loss of $5.11 billion, or 34 cents, a year earlier, the New York-based bank said. On a per- share basis, the bank reported an 18-cent loss because of costs related to preferred dividends. The average estimate of 13 analysts surveyed by Bloomberg was a loss of 32 cents. Citigroup investors hadn’t seen a profit since before Chief Executive Officer Vikram Pandit took over in 2007. While the bank cut compensation costs and took fewer writedowns, it couldn’t halt rising delinquencies on home and credit-card loans. Citigroup benefited from higher fixed-income trading revenue that also bolstered earnings at Goldman Sachs Group Inc. and JPMorgan Chase & Co.
Goldman, which had been expected to report earnings Tuesday morning, said it earned $3.39 per share, beating the Thomson Reuters average estimate of $1.67. The company reported net revenue of $9.43 billion, also easily outpacing the $7.19 billion expected by analysts. The largest segment of Goldman's revenues came from "trading and principal investments" in its fixed-income currencies and commodities division. Again -- thank God for trading desks. The dollar chart formed a double top with the first top occurring late last year and the second top occurring at the end of February/beginning of March. 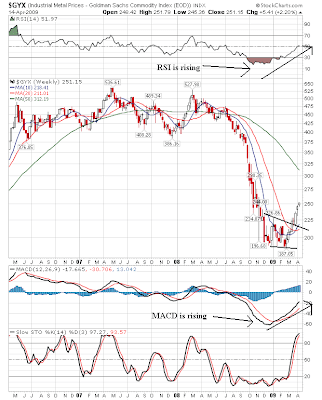 Confirming this development is the corresponding weaker readings from the RSI and MACD on the second top. Prices are tied in with the SMAs in a tight formation signaling a lack of direction. But the recent price action looks like a triangle consolidation pattern which would be a bear market flag pattern. The daily chart shows more clearly the bear market flag pattern. Prices started moving higher in mid-December, but broke through the trend in early March. They sold off but have since consolidated in a triangle pattern which looks an awful lot like a bear market consolidation pattern. 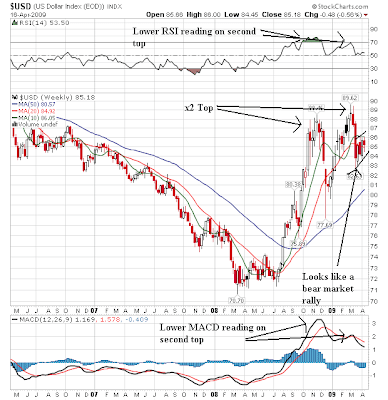 Also note that despite prices moving higher since mid-March, neither the MACD nor the RSI are printing strong numbers. Instead they are both meandering higher. Finally, prices and the SMAs are in a tight formation, indicating a lack of conviction from traders. The main point with all the charts below is they have all broken through key upside resistance. That is technically incredibly important. Also note that all three have done so on higher volume totals. If these levels hold tomorrow then the market will technically be in good shape. The Fed released the Beige Book yesterday. In general the report was negative. But there were a few glimmers of hope. Reports from the Federal Reserve Banks indicate that overall economic activity contracted further or remained weak. However, five of the twelve Districts noted a moderation in the pace of decline, and several saw signs that activity in some sectors was stabilizing at a low level. Manufacturing activity weakened across a broad range of industries in most Districts, with only a few exceptions. Nonfinancial service activity continued to contract across Districts. Retail spending remained sluggish, although some Districts noted a slight improvement in sales compared with the previous reporting period. Residential real estate markets continued to be weak. Home prices and construction were still falling in most areas, but better-than-expected buyer traffic led to a scattered pickup in sales in a number of Districts. Nonresidential real estate conditions continued to deteriorate. Difficulty obtaining commercial real estate financing was constraining construction and investment activity. Spending on business travel declined as corporations cut back. Reports on tourism were mixed. Bankers reported tight credit conditions, rising delinquencies, and some deterioration of loan quality. Agricultural conditions were generally favorable across Districts, although drought conditions persisted in the Dallas and San Francisco Districts. The Districts reporting on energy said reduced demand, high inventories, and lower prices led to steep cutbacks in oil and natural gas drilling and production activity. The Minneapolis, Kansas City, and Dallas Districts noted declines in employment in the oil and gas extraction industry. Downward pressure on prices was reported across Districts. Wage and salary pressures eased as labor markets weakened in all Districts, and many contacts continued to report job cuts and wage and hiring freezes. Employment continued to decline across a range of industries, with only scattered reports of hiring. The Chicago and Kansas City Districts said declines in production had slowed. The Cleveland District noted some leveling off in declines in new orders, and the New York and Dallas Districts noted that demand was beginning to bottom out following steep declines. In contrast, orders and sales of high-tech equipment firmed somewhat at very weak levels in the Dallas and San Francisco Districts. Defense firms in the Boston and Cleveland Districts reported solid activity. Food manufacturers saw sales gains in the Philadelphia and San Francisco Districts, and a food manufacturer in the St. Louis District noted plans to open a new plant. Pharmaceutical firms in the Boston and Chicago Districts continued to see solid demand; petrochemical producers in the Dallas District noted a slight turnaround in operating rates. Manufacturers' assessments of future factory activity improved marginally over the survey period as well, with contacts in the Boston, New York, Philadelphia, Atlanta, and Kansas City Districts noting a slight upturn in the outlook for production and sales. However, several Districts said sales rose slightly or declines moderated compared with the previous survey period. In particular, the Boston, Cleveland, and Chicago Districts reported an improvement in sales. .... but [car] dealers in the Cleveland District reported minimal problems with floor-plan financing. While auto dealers in the Boston, Cleveland, and Kansas City Districts noted some improvements in the outlook, those in the Philadelphia and Dallas Districts expect continued weakness. Housing markets remained depressed overall, but there were some signs that conditions may be stabilizing. Many Districts said factors such as homebuyer tax credits, low mortgage rates, and more affordable prices led to a rising number of potential buyers. The Richmond, Atlanta, Minneapolis, Kansas City, and San Francisco Districts noted a modest improvement in sales in some areas. Most Districts reported weaker loan demand overall, but the reports were mixed across loan categories. In particular, the New York, Richmond, and Kansas City Districts noted an increase in residential real estate loans. Additionally, residential refinancing activity remained brisk, although the loan process was taking longer due to more stringent appraisals and underwriting standards. In contrast, Districts including Cleveland, Chicago, and Minneapolis reported some hiring in healthcare. Contacts in the Richmond District noted solid demand for technically-skilled professionals and IT and office-support workers. The Chicago and Dallas Districts saw a slight uptick in hiring of finance personnel due to the sharp increase in mortgage refinance activity. The St. Louis District reported that a food manufacturer and some wood and plastic manufacturers planned on expanding their operations and hiring additional staff (however, conditions are still "bleak"). Industrial production fell 1.5 percent in March after a similar decrease in February. For the first quarter as a whole, output dropped at an annual rate of 20.0 percent, the largest quarterly decrease of the current contraction. At 97.4 percent of its 2002 average, output in March fell to its lowest level since December 1998 and was nearly 13 percent below its year-earlier level. Production in manufacturing moved down 1.7 percent in March and has registered five consecutive quarterly decreases. Broad-based declines in production continued; one exception was the output of motor vehicles and parts, which advanced slightly in March but remained well below its year-earlier level. Outside of manufacturing, the output of mines fell 3.2 percent in March, as oil and gas well drilling continued to drop. After a relatively mild February, a return to more seasonal temperatures pushed up the output of utilities. The capacity utilization rate for total industry fell further to 69.3 percent, a historical low for this series, which begins in 1967. First quarter production dropped at a 20% annual rate. There is no way to spin that as good news. That is terrible news. In addition, production has dropped 13% below the same level as last year -- another terrible statistic. Finally, there have been 5 monthly drops in production. That -- again -- is terrible. 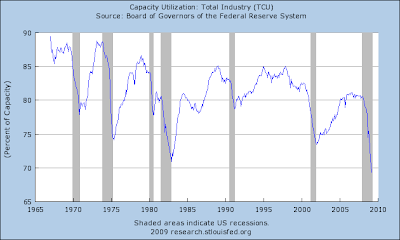 Capacity utilization is at its lowest level in over 40 years. Let's assume we get of this recession by the end of the year. Do you think companies that are at 40+ year lows in capacity utilization are going to be purchasing new equipment? Neither do I. This does not bode well for equipment and software investment, which is about 8.4% of US chained GDP. This means we can't count on that to pull us out of the recession in any meaningful way. Consider these charts from the report. 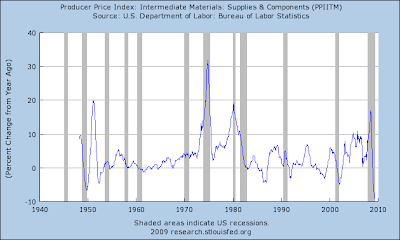 Notice that construction and durable goods are dropping like stones. Click on all images for a larger image. The weekly chart still has a bullish bias. 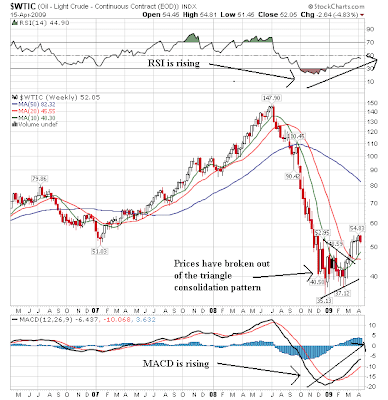 Notice the MACD and RSI is rising and prices have broken out of a triangle consolidation pattern. While prices are still below the 50 week SMA, the 10 week SMA is moving higher and has crossed over the 20 week SMA. Also note the 20 week SMA is leveling off. Finnally, prices are above the 10 and 20 week SMAs which will pull these SMAs higher. 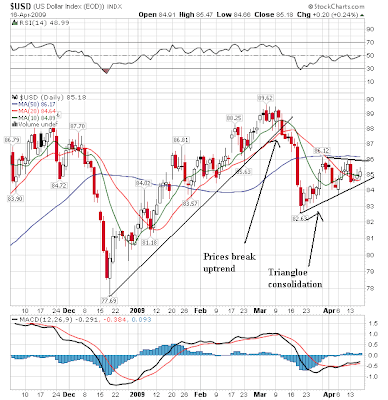 Prices broke out of a triangle consolidation pattern in early March. However, prices peaked from that rally in late March. Since then prices have been consolidating in a sideways move. 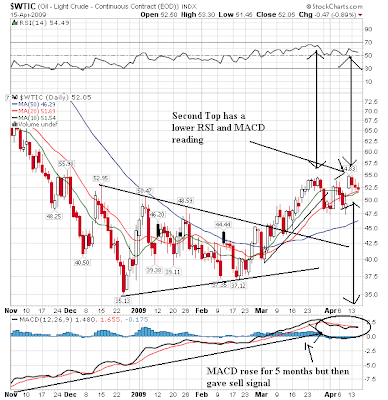 Notice that the MACD is now drifting lower and gave a sell signal at the beginning of April. Also note that the RSI printed a lower high on the second price top in mid-April. Prices and the SMAs are jumbled together giving no clear reading of direction. Gas prices are still increasing slightly. The timing and pace of the global economic recovery will determine whether the higher crude oil prices seen during March are sustainable. The prospects of limited growth in non-OPEC production and the expected start of economic recovery later this year, that should increase oil consumption and the demand for OPEC oil, are the main factors supporting the upward price path. If economic recovery begins earlier and is stronger than assumed in this Outlook, there is an upside risk of higher oil prices than currently projected. The downside risk to oil prices is a scenario of a prolonged economic downturn followed by a weak recovery, which could produce a greater decline in consumption than currently expected. This latter scenario would challenge the willingness of OPEC's members to sustain lower output levels for a longer period. Consumption. World oil consumption is expected to drop by 1.35 million barrels per day (bbl/d) in 2009 compared with year-earlier levels, due to the global economic recession. EIA assumes that the global gross domestic product (GDP), weighted by oil consumption, will fall by 0.8 percent this year. Consumption is expected to fall by 1.6 million bbl/d in the OECD countries and rise by 270,000 bbl/d in non-OECD nations. The bulk of the decline is expected to be concentrated in the first half of the year (World Liquid Fuels Consumption). World oil consumption is expected to grow by 1.1 million bbl/d in 2010, driven by a recovery of global GDP growth to 2.6 percent. In other words, there are mixed signals in the oil market. Current prices are the result of expectations, not underlying facts. Traders are hoping that fundamentals will catch up with prices. Further complicating the mix are the continued OPEC production cuts. Right now the daily chart says prices are going to move sideways for awhile and wait. Prices have already rallied; now traders want to see if fundamentals catch-up. The main point to note with all three charts below is prices are approaching or are directly on the upward sloping trendline that started in early March. That means we are at technically important levels. In addition, we have two more days for this week and traders may not want to hold positions over a two day weekend. Also remember we are in the middle of earnings season, possibly adding to the hair trigger of traders. Finally there is the basic question of whether or not the economic fundamentals support the current market rally. In the event of a sell-off (which would be a natural development considering the run we've had) there are plenty of technically important support levels. Those are in the second series of charts which include all the simple SMAs along with Fibonacci levels and various other technically important levels. The Consumer Price Index for All Urban Consumers (CPI-U) increased 0.2 percent in March, before seasonal adjustment, the Bureau of Labor Statistics of the U.S. Department of Labor reported today. 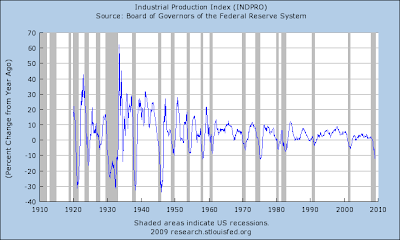 The index has decreased 0.4 percent over the last year, the first 12 month decline since August 1955. On a seasonally adjusted basis, the CPI-U decreased 0.1 percent in March after rising 0.4 percent in February. The decrease was due to a downturn in the energy index, which declined 3.0 percent in March after rising 3.3 percent the previous month. All the energy indexes decreased, particularly the indexes for fuel oil, natural gas, and motor fuel. The food index declined 0.1 percent for the second straight month to virtually the same level as October 2008. The food at home index declined 0.4 percent, the second straight such decrease, as the index for dairy and related products continued to decline. All the energy indexes decreased, particularly the indexes for fuel oil, natural gas, and motor fuel. The food index declined 0.1 percent for the second straight month to virtually the same level as October 2008. The food at home index declined 0.4 percent, the second straight such decrease, as the index for dairy and related products continued to decline. The index for all items less food and energy increased 0.2 percent for the third month in a row. Looking at the chart above, note the gray lines the show the year over year percent change in the core rate. 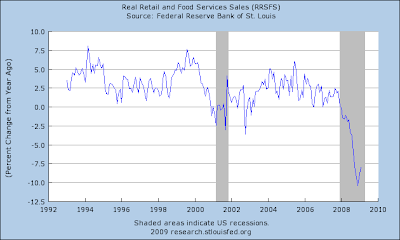 That series of data points stands just shy of two percent which is also encouraging from an anti-deflation standpoint. That does not mean we are out of the woods yet, however. 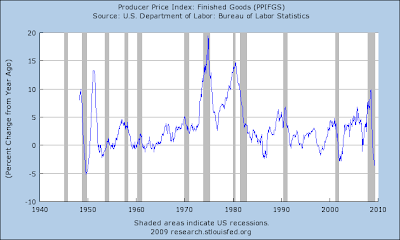 The Producer Price Index for Finished Goods decreased 1.2 percent in March, seasonally adjusted. This decline followed a 0.1-percent advance in February and a 0.8-percent increase in January. Remember, producer prices feed into consumer prices. This means they happen first. 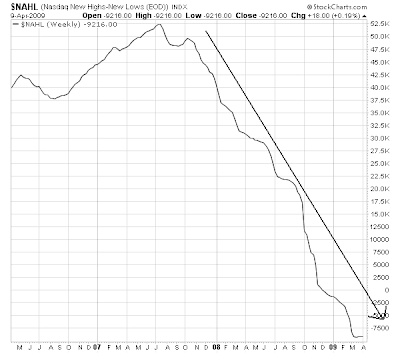 So the drop above could start to hit CPI eventually. 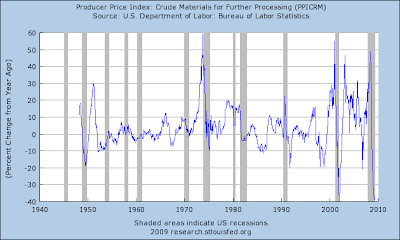 PPI prices are broken down into three categories: crude goods, intermediate goods and finished goods. Here are the charts of the year over year percentage change in all three. All three show incredibly large year over year drops. While at some time in the past we have been at these levels, its not very often. As a result, we need to keep an incredibly close eye on these data points. Tech bellwether Intel late Tuesday reported first-quarter profit far above analyst views, but it again opted not to provide guidance for the current quarter because of the uncertain economy. Worried investors sent Intel shares falling about 5.5% after hours, after it released results that included some positive indicators. "We believe PC sales bottomed out during the first quarter, and that the industry is returning to normal seasonal patterns," Intel (INTC) Chief Executive Paul Otellini said in a statement. The No. 1 chipmaker reported per-share profit of 11 cents. That's down 56% from the year-earlier quarter, but far above the 3-cent consensus estimate of analysts polled by Thomson Reuters. Sales fell 26% to $7.14 billion, just above the $6.98 billion expected by analysts. In a conference call with analysts, Otellini said the "global economy continues to be weak and uncertain" and "demand remains difficult to predict," but Intel's execution during the quarter "was outstanding." All industrial production save communication's equipment is down and overall capacity utilization in the high tech sector has taken a nose dive. Semiconductors are down more sharply than the last recession which is obviously an issue for Intel. The above chart is why Intel is not offering any forward guidance. Industrial prices are doing well; they have broken through the upside resistance of the consolidation pattern they were in. This break is strong. In addition, the MACD and RSI are rising and have room to run. The 10 week SMA is rising and has moved through the 20 week SMA. The 20 is turning positive but is not there yet. Prices are above the shorter SMAs which will pull them higher, but prices are still below the longer SMAs which is still heading lower. 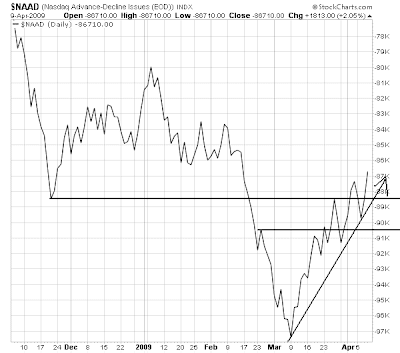 Although agriculural prices have moved out of the triangle consolidation pattern, they hvae not followed industrial metals higher in as strong a manner. 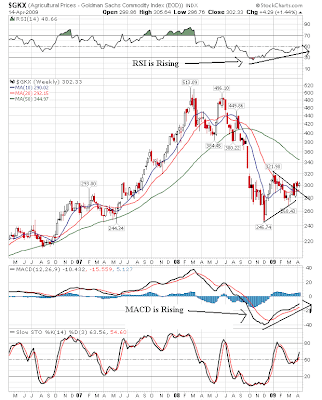 This despite strong readings from both the MACD and the RSI. Notice the weekly SMAs are meandering with prices instead of forming a solid bullish pattern. This indicates indecision on the part of traders about the future price moves. This is not an environment where demand for industrial metals is increasing. At least not in my opinion. The main issue with the market is will it or won't it rise over the trend line that stands just above current prices. Right now -- and for the last two days -- we've had prices essentially move somewhat sideways and towards the upward sloping trendline just to the right. Essentially prices are biding time until ... something. There is also the need to consolidate recent gains. It should be noted that it's impressive that prices have not dropped through the trendline, indicating there is still some bullish sentiment about the market right now. On the 10 day 5 minute chart, notice that for the last three days the 84.25 level has been incredibly important. A move through that level would indicate a breakdown of the the last three days price action. I mentioned earlier that the Fed's mandate from the Congress is to foster price stability as well as maximum sustainable employment. The FOMC treats its obligation to ensure price stability extremely seriously. Price stability supports healthy economic growth, for example, by making it easier for households and businesses to plan for the future. In practice, price stability does not require that inflation be literally zero; indeed, although inflation can certainly be too high, it can also be too low. Experience suggests that inflation rates that are close to zero or even negative (corresponding to deflation, or falling prices) can at times be associated with poor economic performance. Cases in point include the United States in the 1930s and the more recent experience of Japan. In their latest quarterly projections of the economy, most members of the FOMC indicated that they would like to see an annual inflation rate of about 2 percent in the longer term. Right now, because of the weakness in economic conditions here and around the world, inflation has been running less than that, and our best forecast is that inflation will remain quite low for some time. Thus, the Fed's proactive policy approach is not at all inconsistent with the goal of price stability in the medium term. Although inflation seems set to be low for a while, the time will come when the economy has begun to strengthen, financial markets are healing, and the demand for goods and services, which is currently very weak, begins to increase again. At that point, the liquidity that the Fed has put into the system could begin to pose an inflationary threat unless the FOMC acts to remove some of that liquidity and raise the federal funds rate. We have a number of effective tools that will allow us to drain excess liquidity and begin to raise rates at the appropriate time; that said, unwinding or scaling down some of our special lending programs will almost certainly have to be part of our strategy for reducing policy stimulus once the recovery is under way. We are thinking carefully about these issues; indeed, they have occupied a significant portion of recent FOMC meetings. I can assure you that monetary policy makers are fully committed to acting as needed to withdraw on a timely basis the extraordinary support now being provided to the economy, and we are confident in our ability to do so. To be sure, decisions about when and how quickly to proceed will require a careful balancing of the risk of withdrawing support before the recovery is firmly established versus the risk of allowing inflation to rise above its preferred level in the medium term. However, this delicate balancing of risks is a challenge that central banks face in the early stages of every economic recovery. I believe that we are well equipped to make those judgments appropriately. In addition, when the time comes, our ability to clearly communicate our policy goals and our assessment of the outlook will be crucial to minimizing public uncertainty about our policy decisions. Secondly, and far more importantly, the argument I continually hear is "there is a huge risk of inflation because of all the money the Fed is printing." 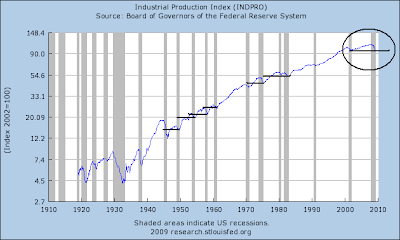 And if the Fed stood pat for an extended period of time that would be a problem. But people seem to forget the Fed can raise rates as well as lower them. That means when the economy starts to get stronger, the Fed can start to mop up excess liquidity. While I think it's possible to have too much confidence in the Fed, I also think it's extremely possible to have too little. First -- this is without a doubt one of the most useless when issued statistics imaginable. It's not inflation adjusted and the total number includes an entire variety of numbers that make more sense as a solo statistics. The U.S. Census Bureau announced today that advance estimates of U.S. retail and food services sales for March, adjusted for seasonal variation and holiday and trading-day differences, but not for price changes, were $344.4 billion, a decrease of 1.1 percent (±0.5%) from the previous month and 9.4 percent (±0.7%) below March 2008. 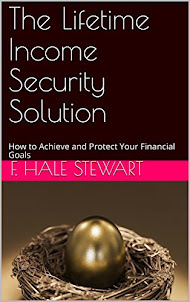 Total sales for the January through March 2009 period were down 8.8 percent (±0.5%) from the same period a year ago. The January 2009 to February 2009 percent change was revised from -0.1 percent (±0.5%)* to +0.3 percent (±0.3%)*. 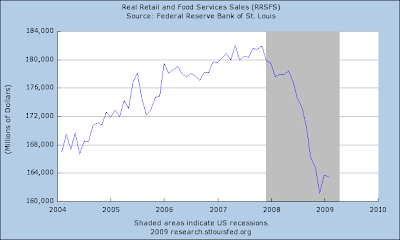 Retail trade sales were down 1.1 percent (±0.7%) from February 2009 and 10.7 percent (±0.7%) below last year. Gasoline stations sales were down 34.0 percent (±1.5%) from March 2008 and motor vehicle and parts dealers sales were down 23.5 percent (±2.3%) from last year. The London interbank offered rate for three-month dollar loans is dropping at the fastest pace since January as bankers gain confidence that the worst of the financial crisis is over. Debt strategists at Credit Suisse Group AG, Societe Generale SA and Royal Bank of Canada, three of the 16 banks that provide the data that sets Libor each day, say the declines will continue. Momentum may be building as signs of economic stability emerge, according to Federal Reserve Chairman Ben S. Bernanke. Libor, the British Bankers’ Association interest rate that determines borrowing costs on about $360 trillion of financial agreements ranging from home mortgages to corporate bonds, fell to 1.12 percent today from 1.32 percent a month ago. The fastest drop since the start of the year, when the rate tumbled to 1.08 percent on Jan. 14 from 1.42 percent nine days earlier, coincides with President Barack Obama’s efforts to restore the economy and the banking system to health. A big issue for many financial institutions over the last year and a half is the viability of the counter-party. That is, "if I lend you money, will you be around in the next three months to repay the loan?" That is what essentially froze the credit markets. Now that we've seen the government pour trillions into the system, people are now more and more confident that a counter-party will be around. And that has increased confidence. Well, there are many problems. Probably the biggest is they are a shadow market when in fact they should be traded on an open, regulated exchange. That would end many of the problems we currently have. However, the second biggest problem we have no idea how to tax them. The problem is they could be conceivably be three things, although I think it boils down to two. Are they insurance? In some CDS transactions, the person purchasing the contract is compensated for in cash. The person selling the contract pays the purchaser cash based upon the difference between a value specified in the contract and the then market value of the CDS. Essentially, the person purchasing the contract has shifted the risk (key legal term) to the seller, forcing the seller to pay x amount of dollars at a specific time. There is another key legal issue with risk distribution which raises some problems here, but I believe that proper regulation would prevent that from happening. Are they an option? In other CDS transactions, the buyer will put a specific investment to the seller much like an option. In effect, the buyer pays for the right to say, "this is now worthless. You take it. By the way, you have to pay a previously agreed to price." This is essentially an option. Further complicating the matter is the way CDS are documented. First, there is a "master agreement" between parties which essentially establishes an entire framework for how they will interact. Then each transaction can have its own terms and conditions. The point of this methodology is to promote the transaction process -- that is, to create an environment where people write a lot of transactions. These documents are available from the International Swaps and Derivatives Association. I'm currently writing a paper on this -- which is why I bring it up. Unfortunately there are no clear answers -- just intellectual mud. -- The SMA picture is a mess; it's jumbled and unclear. Compare that to a standard bull market chart where prices are above all the SMAs and the shorter SMAs are above the longer SMAs. Remember that in a consolidating market stochastics are a better indicator of possible future directions. Here we see a stochastic that says the possibilities of moving higher are, well, higher. Remember -- that is a technical conclusion that does not include fundamental calculations. Before we get to today's chart, here's the basic conclusion from all the charts about whether or not we're in a bull market. The information reviewed at the March 17-18 meeting indicated that economic activity had fallen sharply in recent months. The contraction was reflected in widespread declines in payroll employment and industrial production. Consumer spending appeared to remain at a low level after changing little, on balance, in recent months. The housing market weakened further, and nonresidential construction fell. Business spending on equipment and software continued to fall across a broad range of categories. Despite the cutbacks in production, inventory overhangs appeared to worsen in a number of areas. Both headline and core consumer prices edged up in January and February. Simply put, this is not an environment where stocks have the economic fundamentals at their backs. And that makes this a bear market rally. The 6 day chart shows that prices consolidated last Tuesday and Wednesday, jumped on Thursday and then continued their move higher today. Today note that prices opened lower, rallied and then fell until about 11 AM when they started to move higher for the remainder of the day. However, there was a large sell-off at the end of the day on high volume indicating traders did not want to keep positions overnight. On the daily chart, notice that prices are still in an uptrend. Today's action merely provided us with a slight technical improvement over yesterday. However, pay particular attention to the lack of volume, especially over the last week or so. Trader's have not been participating in a big way. Now -- there has not been a sell-off either, which is good news. But, there is still plenty of reason to be concerned at this point. The NYSE advance/decline line still hasn't moved above the upside resistance levels established right at the beginning of this year. The NYSE new high/new low is still clearly moving lower. Aside from the NASDAQ advance/decline line, all three other market breadth indicators are still moving lower. 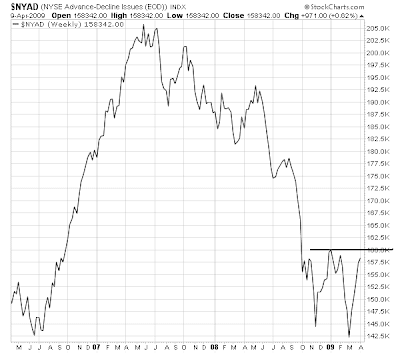 That tells us there is a lack of market breadth to this rally which does not bode well fore the future prospects of this rally. Click on all images for larger image. As I mentioned below, I'm taking an in-depth look at all the averages today to see if we really are in a bull market or whether this is a bear market rally. Below are overviews of the SPYs and the QQQQs. Below is a look at the IWMs, or the Russell 2000. These companies require overall GDP growth to move higher. Therefore this index is a good proxy for investor's and trader's risk appetites. The index did remarkably well for an extended period of time, especially considering the economic backdrop started to falter in the middle of 2007. But it wasn't until the end of the third quarter of 2008 that the index really took it on the chin. From top to bottom, the IWMs have lost about 46%. A large chunk of that occurred in the last half of last year. The short term (6 month chart) shows some current action that is strong. 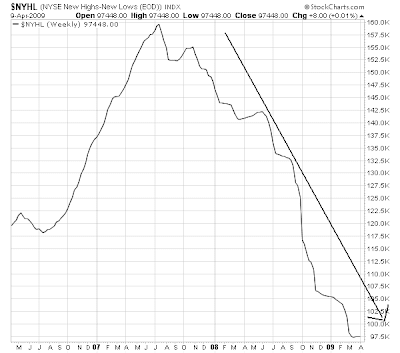 -- Prices have moved through the downward sloping trend line that connects several recent lows. -- Prices are just shy of another downward sloping trend line. My primary concern is the overbought condition of the MACD and RSI. However, as I mentioned below, RSIs can remain overbought for sometime. But the MACD is especially disconcerting as it is usually a pretty reliable indicator of momentum. In addition, the market is pricing in a big economic turnaround and I'm not sure that's in the card right now. While I do think the economy will rebound somewhere between the 4th quarter of this year and the end of the 2nd quarter next year, that could still be a year+ away right now.